CoWrks, one of India's largest co-working space providers, announced the launch of 'Converge' - a first of its kind solution for business meetings and events. 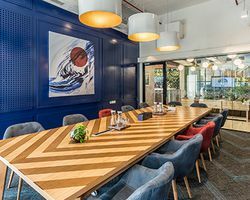 Converge by CoWrks offers spaces that are powered by seamless technology and premium hospitality for professional meetings and events in prime properties across 23 locations and 5 cities (Bangalore, Chennai, Hyderabad, Mumbai, Delhi - NCR) in India. Converge empowers professionals and organizations to avail meeting rooms, boardrooms, conference and event spaces through a seamless tech-powered booking experience. It further offers, planning and production support, world-class space design, high-speed secure Internet, premium hospitality, gourmet F&B offerings and state-of-the-art AV. With the evolution of workspaces, Converge aims to reinvent the business meeting and event landscape. It is a one-stop solution for compact small meetings to expansive events - be it a cluster of 4, or a diverse crowd of 400. Commenting on the development, Nruthya Madappa, Director - New Products, CoWrks, said, "We are excited to launch our brand new product 'Converge' which is an extension to our existing premium workspace solutions. With Converge, CoWrks is foraying into avenues that will revolutionize the way businesses work. Most meeting and event spaces that are available today are not fully equipped with solutions that match the requirements of businesses. With Converge, we aim to provide meeting/event spaces with quality services, hospitality and best-in-class amenities at CoWrks. Our spaces are carefully designed to deliver tailored experiences that fuel productivity. Bookings for Converge are now open across locations in India. Businesses/individuals can visit the website www.convergehere.com to select the meeting/event space of their choice with an array of F&B and customization options that are available at transparent pricing with no intermediaries involved.